Flicker Alley is sponsoring this fabulous event in celebration of their new Early Women Filmmakers box set (it will be released May 9, 2017). So come on in, relax and prepare to greatly expand your watchlist for your #52FilmsByWomen project. I will be updating this roster over the course of the event so check back often. Actually come to this page, don’t look through a salt shaker. I mean, you CAN, I won’t stop you but it would be difficult to read the updates. France pioneered many film innovations and they also can claim the very first known woman director, Alice Guy. An examination of Guy’s religious film, which puts women front and center. A discussion of Agnes Varda’s examination of self-absorption and identity. An examination of the first known woman director’s career. The career of a brilliant feminist filmmaker. A marriage in crisis, a suicide hoax and live bullets. Yes, women directed films in the mainstream American film industry! Here are some of them. A whirlwind tour of Mabel Normand’s surviving works as director. Arzner directs Joan Crawford in this Golden Age soaper. Davenport’s long career celebrated; she was more than just Mrs. Wallace Reid. 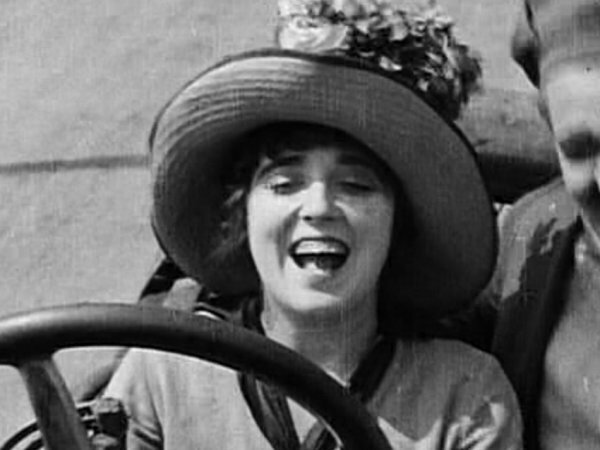 Mabel Normand’s directing skills were tested in Mabel at the Wheel (1914). An examination of Weber’s social justice drama about underpaid educators. Lupino’s desert noir gets its due! Lupino’s big career on the small screen. Arzner directs Lucille Ball and Maureen O’Hara in a backstage melodrama. Weber’s drama has a heaping helping of social issues. Lupino directs a comedy about mischievous Catholic schoolgirls. Women filmmakers can be found in almost every industry. Sagan’s influential drama set in a girls’ school during the last days of the Weimar Republic. One of the women directors of the Soviet Union gets her due. Never heard of her? Don’t worry, they’ve got your back! An examination of the career of Brazil’s forgotten director. An examination of the Canadian amateur filmmaker and cineaste. Review of a documentary from an Iranian director. Meet three women behind the camera in South Korea. Women directors were present in most of the major film industries when sound arrived and they contributed their innovations to the new art. An examination of Arzner’s final film for Paramount. Arzner helms Clara Bow’s first talkie. The lead-up and aftermath of WWII included many opportunities and much inspiration for women directors. An examination of Riefenstahl’s most chilling motion picture. Larissa Shepitko’s beautiful, melancholy examination of a Soviet pilot’s life after her return from the war. A celebration of Deren’s unique career. Women were pioneers and innovators in the field of animation as well– often outside the realm of the standard cel technique. A celebration of Reiniger’s masterpiece of silhouette animation. A glorious monochromatic adaptation of the famous Gogol short story. Can I blog about Ida Lupino? Please let me know if I can? If the topic you want to cover is on the list, it has already been claimed. Yes I see many of the topics are taken. In that case, there is an Indian film producer called Devika Rani, I could write about her life in contradiction with her film, Achut Kanya. Would that be ok? The event is limited to women film directors, so the film would have to be directed by a woman. Sorry I couldn’t come up with better suggestions. The event looks great though and the idea of 52films is awesome too! Hi Fritzi. My post is ready. I’m so sorry I’ve not been able to partecipate in this. I’m up to my neck in the preapration of my AtoZ Challenge posts and I’m so behind (will blog about film noir, by the way 😉 ). But I can’t wait to read the entries. I’ve already seen lots of intersting ones. Thanks for letting me know! All the best. All these lovely links, all these great reviews…know what I’ll be reading this evening! Thank you, everybody!!! Yes, the participants really pulled out all the stops! Thanks so much for hosting and I am looking forward to reading all of the great pieces! Of course. It doesn’t help that they both wrote about German films from the 30s. When are you planning to update your site? Thanks so much for hosting this. I’m going through the posts now, and am learning SO MUCH about film history. Also: Thank you for the sandwich recipe. I might just make one right now. I’m so sorry I won’t be able to participate. I really tried getting my post ready by this week, but I fell ill to a stomach bug recently and it’s pushed a lot of things back for me. I’m looking forward to reading all these interesting posts though! Good morning. Some great articles coming in! Had to make sure South Korean cinema was represented in this blogathon so here’s a post on Park Nam-ok, Hong Eun-won, and Choi Eun-hee. Hi Fritzi. I finally finished reading every post and commenting on every one I could. This was one of my favorite blogathons. People came up with some excellent posts. Thank you to you for all the hard work and to all the people who posted. So glad you enjoyed! Yes, the participants were just amazing this time, weren’t they?